System CID-42, located about four billion light-years away from Earth, harbors a supermassive black hole that is apparently being booted out of its home galaxy. A supermassive black hole is apparently being ejected from its host galaxy at a fantastic speed, suggesting that such light-gobbling monsters may roam freely throughout the universe, a new study reports. The giant black hole appears to have collided and merged with another black hole. The newly supersized object then likely received a powerful recoil kick from gravitational wave radiation that booted it out into space at several million miles per hour, researchers said. "It's hard to believe that a supermassive black hole weighing millions of times the mass of the sun could be moved at all, let alone kicked out of a galaxy at enormous speed," said study leader Francesca Civano, of the Harvard-Smithsonian Center for Astrophysics (CfA), in a statement. The new study, which will be published in the June 10 issue of The Astrophysical Journal, relies on observations made by a variety of telescopes. Using NASA's Hubble Space Telescope, Civano and her team had previously spotted two distinct sources of optical light in a system known as CID-42, which is located in a galaxy about 4 billion light-years from Earth. More optical data from two instruments in Chile suggested that the two light sources are moving apart at a speed of at least 3 million mph (5 million kph), researchers said. NASA's Chandra space telescope had also detected a bright X-ray source in CID-42, which was likely caused by super-heated material around one or more gigantic black holes. But those observations weren't quite detailed enough to give astronomers the full story. 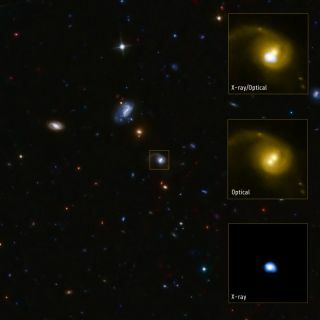 "The previous data told us that there was something special going on, but we couldn't tell if there were two black holes or just one," said co-author Martin Elvis, also of the CfA. "We needed new X-ray data to separate the sources." New Chandra observations have now confirmed that X-rays were coming from only one of the sources, suggesting the following scenario: Two galaxies collided, and the supermassive black holes at their hearts merged. Gravitational waves produced by the collision then booted this hybrid black hole out into space. But there are two other possible explanations for what's going on in CID-42, researchers said. Three supermassive black holes in the area may have had a run-in, causing the lightest one to be ejected. Or CID-42 may contain two supermassive black holes that are spiraling toward one another, rather than one zooming quickly away. However, both of those alternate explanations would require at least one supermassive black hole to be heavily obscured, since only one bright X-ray source is visible, so the Chandra data most strongly support the idea of a black hole recoiling because of gravitational waves. If the researchers' interpretation is correct, it could mean that there are many supermassive black holes roaming unbound in the vast stretches of intergalactic space. And it could be tough to track these objects down. "These black holes would be invisible to us, because they have consumed all of the gas surrounding them after being thrown out of their home galaxy," said co-author Laura Blecha, also of the CfA.